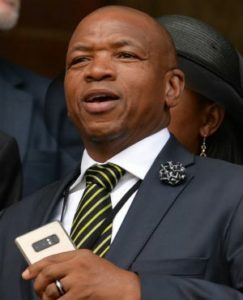 Supra Mahumapelo whose full name is Supra Obakeng Ramoeletsi Mahumapelo is a South African politician. He served as the Provincial Secretary of the African National Congress North West Provincial Leadership from 2011 till August 2018. Supra also served as Speaker of the North West Provincial Legislature and member of the North West Provincial Legislature and Premier of North West. He was born on the 7th of June 1964 in Manamolelo outside Delareyville to Steve Mahumapelo and Agnes Bereng. As of 2018, he is 54 years old. He is married to Kule Mahumapelo. She owns a foundation that is working in partnership with the South African Social Security Agency and other stakeholders. The primary objective of the foundation was to help orphans but it later integrated the elderly people. In 1996, he got married to Christinah Kgari. Together they have four children, two boys, and two girls. Supra also became a grandfather of recent when his first child was blessed with a son. He resides with his family in Mafikeng. His parents are late. His father Steve Mahumapelo passed on in 1997 while his mother Agnes Bereng passed on in 2008. 1994 he was appointed as an ANC Provincial Deputy Elections Co-ordinator in Klerksdorp. In 1995 he was elected as the Mmabatho ANC Branch Chairperson. 1998 he was elected as the Provincial Chairperson of the ANCYL in NW. In 2002 Supra Mahumapelo was elected as an additional member of the ANC PEC in NW. In 2005 he was elected as the ANC Provincial Secretary.